By Scott Gilfoid: Former WBC cruiserweight champion Tony Bellew and David Haye will be soon facing each other in a rematch on December 17 at the O2 Arena in London, England. Bellew, 34, thinks Haye hates him after getting stopped in the 11th round by him last March in London. 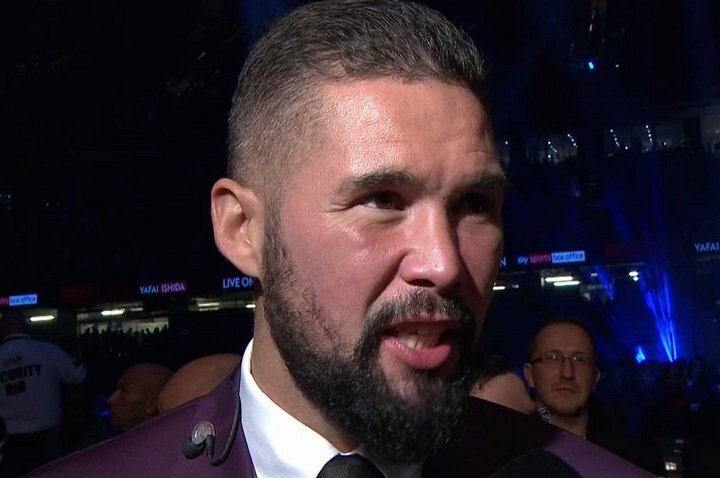 Bellew takes full credit for winning the fight despite the fact that he was losing until Haye (28-3, 26 KOs) suffered a bad Achilles injury in round 6. Bellew (29-2-1, 19 KOs) believes that he’s going to win again, but the bettors and boxing fans disagree. Without another bad injury for Haye, Bellew will all probability wind up getting knocked out. It’s interesting how Bellew is only looking into what Haye feels about him rather than admitting that he can’t stand him as well. It’s obvious that Bellew dislikes Haye intensely, and it’s also clear that he realizes that he got lucky last time. Bellew doesn’t like the fact that many fans in the boxing public didn’t give him credit for his win over Haye. The fans overwhelmingly saw Bellew winning due to the injury that Haye suffered to his Achilles in round 6. Haye wasn’t at his best in the fight, and I think he’ll be the first to admit that. Haye looked rusty, and he was struggling to land his big powers shots with the way that Bellew was spoiling. Never the less, Haye was controlling the fight with his power jab, which is one of the best in the heavyweight division. It looked painful each time Haye would connect with his Golovkin-like jab to the head of Bellew. After round 2, the fight was clearly going Haye’s way. Bellew started off well in the first 2 rounds, but he was struggling once Haye started using his jab. It was no longer an interesting fight after the 2nd. What arguably saved Bellew was the injury Haye suffered to his Achilles. That was the miracle for Bellew. He was going to lose by a lopsided decision if not for Haye blowing out his Achilles. Like has nothing to do with the rematch. It doesn’t matter if Haye dislikes Bellew or not. It’s Haye’s fight unless he gets injured. That’s the way I see it going down. Without Haye suffering another debilitating injury, Bellew doesn’t have a chance to win. Bellew says he doesn’t hate Haye. I bet. I think he clearly doesn’t like Haye, but who cares? Bellew doesn’t have to like Haye. Bellew needs to prove that he can win without being aided by another injury, and I don’t think he can. Haye might have beaten Bellew even with his bad Achilles last March if his trainer hadn’t stopped the fight after he fell out of the ring. Haye’s corner stopped the fight while he was climbing back inside the ring. Moments before that, Bellew was unloading on Haye with him backed against the ropes. Haye was throwing huge left hooks and uppercuts, and barely missing Bellew. All it would have taken for Haye to score a knockout was for him to land one of those shots. It was lucky for Bellew that Haye didn’t connect with his left hand. It was fortunate for Bellew that Haye’s trainer stopped the fight, because we might have seen a highlight reel knockout if the fight had been allowed to play out to its natural conclusion. I would have liked to have seen Bellew fight someone like Carlos Takam while waiting for Haye’s injury to heal. At least we could have seen how Bellew would do against an uninjured heavyweight. I think Takam would destroy Bellew. I don’t think it would be a fight.